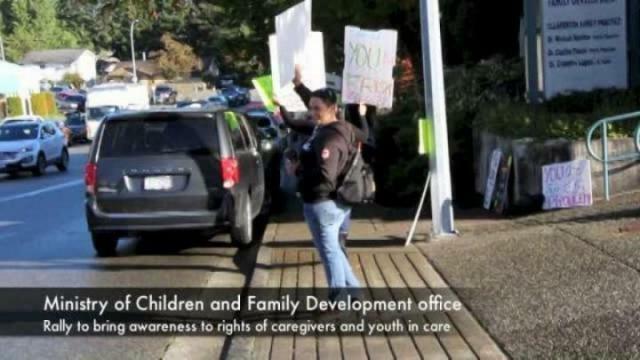 Protestors rally outside of the Ministry of Children and Family Development office on Cruickshank Street in Abbotsford on Tuesday morning. Kearston Burton was placed in 34 group and foster homes over two years, starting at the age of 13. In one home, she was fed nothing but instant noodles and was denied feminine hygiene products. In another, she was physically abused by her foster dad. Burton said she tried to speak out about the abuse, but no one took her seriously. She was placed with foster mom Tamara Smith of Abbotsford eight years ago, and there she says she found the love, support and compassion she needed. Burton lived there until she “aged out” of the foster care system at 19. Now 23, she lives in Chilliwack with three kids of her own – ages two, three and five – and is soon to be married. Burton and Smith were among caregivers, support workers and former youth in care who rallied outside of the Ministry of Children and Family Development office in Abbotsford – located on Cruickshank Street – on Tuesday morning. Smith said it’s the first of several such rallies planned across the province to bring awareness to the rights of caregivers and kids in care, and bring changes to a system she said is not currently working. She said the many good foster parents across the province are not acknowledged or paid accordingly for the hard work they do. Smith said the 2,500 caregivers in the province are treated more like volunteers than professionals. They are not offered affordable health insurance programs, coverage for dental or optical care, or pensions – benefits offered to others in child-welfare roles. She said foster parents are afraid to speak up because of fears they will lose their children in care. Smith said one of the goals of the province-wide rallies is to garner support for foster parents and other caregivers to unionize. She said that will not only ensure their protection from poor working conditions, but will lead to more stringent guidelines about who can take on such a role and better protect kids from negative situations. Smith said she hopes the rallies also bring more awareness to the rights of youth in care. “These kids needs a voice. They need a strong voice. They deserve more than for people to come in and rip them out of homes that they’re doing well in, and to even leave their pets behind,” Smith said. Burton said she felt that when she spoke out about the abuses she was suffering, she was perceived as a liar. She said kids in care need to be taken seriously when they speak out. A spokesperson from the Ministry of Children and Family development wrote, via email, that the province supports caregivers through a variety of services, including training, regional agenices and telephone support. “We recognize and deeply appreciate the hard work and dedication of B.C.’s foster caregivers,” the statement said. The group has started a website to draw attention to its cause. Visit caregiversunite.ca for more information.